CIA Officer the first American killed in Afghanistan after 9/11. Spann’s wife Shannon also worked for the CIA. In addition to his wife, Spann left behindtwo daughters and an infant son. * In past years a commenter has correctly pointed out that Americans were killed in Pakistan in the prelude to the landing of special forces in Afghanistan, but Spann was the first American killed in Afghanistan. Each year since then, on November 25, we have remembered Mike Spann. You can scroll through the Johnny “Mike” Spann tag for all our reports. Each year the research seems to discover new facts and stories, including the letter from Afghan warlord Abdul Rahdis Dostum and the memorial he dedicated in Spann’s memory, interviews with his oldest daughter Alison, and the family’s reaction to the release of Bowie Bergdahl. And a photo of Spann’s father, also named Johnny, placing flowers at his grave at Arlington National Cemetery in February 2005. [Featured Image] He is buried at SECTION 34, SITE 2359. Johnny Spann was driving down the road listening to music Sunday when he got the call: Turn on the news. The father of the first U.S. victim in the Afghan war flipped to a news station. Spann swelled with emotion. He immediately grabbed his BlackBerry and logged on to Facebook, where he posted this status update: “The S.O.B. is finally dead.” …. More than a thousand people have gathered at U.S.S. Alabama Battleship Memorial Park this morning to honor the victims of the September 11 attacks in a special ceremony. Giving the keynote speech at the memorial event is News 5’s Alison Spann, who joined the WKRG Staff in August as a digital journalist. 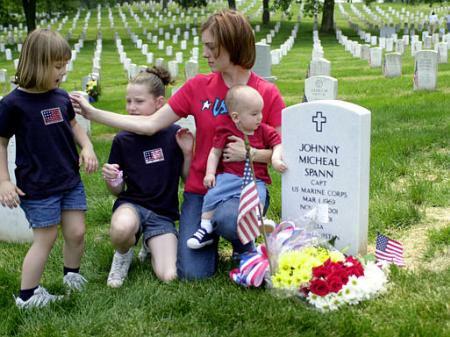 Spann’s father, Johnny Michael Spann, was the first American killed in the U.S. war in Afghanistan. “Mike” Spann was a CIA Captain in the Special Activities Division who was an Alabama native. RIP, sir. You stood in the breech on our behalf. RIP. Not forgotten – never forgotten.